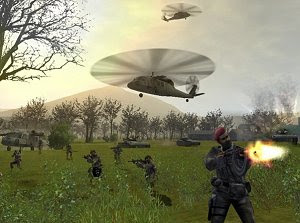 When it was announced, Soldner Secret Wars was supposed to be a game to rival Call of Duty and Battlefield 1942 in what multiplayer had to offer. However, JoWooD didn’t exactly fulfill on that promise when the game hit the retail market during 2004. Soldner Secret Wars was considered a compelling game for those capable of overlooking its flaws, mainly the bugs that hindered the experience. With that being said, the game had a lot going for it, such as the different modes (Capture the Flag, Capture the Vehicle, Deathmatch and Super Conquest, among others) and the ability to combat on foot and using several vehicles, from jeeps, tanks and helicopters. Players may even choose from first-person or third-person views. The 3D graphics are still functional nowadays and Soldner Secret Wars may interest those who missed it the first time around, even more for nostalgia purposes.